United States Naval Academy graduate Nicole Hadler plans to use her medical degree from the University of Michigan to support military service members and their families. Hadler grew up in Medina, Ohio, and developed her interest in chemistry and medicine in high school, after she shadowed a primary care doctor. Chemistry came easily to Hadler, and she had fun coming up with problems and finding solutions through working with materials in a lab. In her free time, she ran cross-country and played tennis. 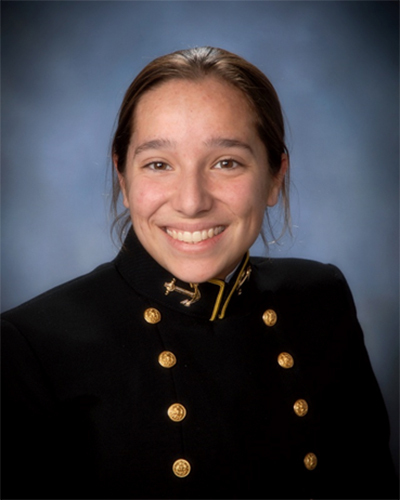 When applying to college, she was drawn to the Naval Academy’s mission of service. She spent a semester abroad at the Chilean Naval Academy, immersed not only in Spanish, taking all of her classes in the language, but also in a different country’s military structure. In addition, she went on two trips to Peru, including spending a month at the Naval Medical Research Unit 6, NAMRU-6. The program is a unique collaboration between American and Peruvian military and Peruvian healthcare professionals. Hadler shadowed doctors at NAMRU-6’s locations in Lima and Iquitos, learning about infectious diseases and tropical medicine. While in Iquitosm she was exposed to the lab’s field research and presented a project involving the use of a new spatial repellent in local communities to combat the spread of dengue and other mosquito-borne diseases. She also completed a spring break trip at El Hogar San Francisco de Asis, a children’s home for sick and destitute children established by an American pediatrician. When applying to medical school, she was interested in the University of Michigan because of the focus on exposing students to patient care early on in their education. For graduate school, she was awarded a military scholarship. After starting medical school last fall, she became involved with Doctors of Tomorrow, a program that pairs first-year medical students with high school freshman interested in the field. The mentorship aligned with Hadler’s passion for working with children. She spent summer 2018 working in the lab of a pediatric oncologist who researches brain tumors. Her project involved studying rare, potentially cancer-causing alterations in certain proteins and human’s ability to therapeutically target these specific proteins. She hopes to return later during medical school to dedicate more time to the cause. Outside of class, she enjoys playing tennis with her peers and recently completed her first marathon. After finishing her residency, she will complete at least nine years of military service as a physician. Although she is considering eventually going into a smaller practice, she is excited for the opportunity to give back.